Every post-acute care provider across the care continuum bears the responsibility for ensuring all patients receive comprehensive, safe and efficient care navigation. As patients transition from one level of care to another, effective care planning is a critical factor in that patient’s overall satisfaction and success. Consider the following “recipe” for successful care transitions. 1) Interdisciplinary teamwork is imperative! How is information formatted and shared among my own interdisciplinary team? Are standardized outcome measures used to inform clear-cut decisions? Are these outcome measures shared so as to maximize continuity of care between hospitals, skilled nursing, assisted/independent living, home health and out-patient partners? Are the current communication protocols providing for the most seamless and effective transition and continuity of care? Is there a well-defined, judicious process for discharge planning? 2) Resident and family engagement is the key ingredient. Family members and patients alike should be empowered to advocate for discharge plans that optimize appropriate care and serve to identify potential barriers and risks. To this end, on-going support and education for patients/caregivers assures effective care transitions, and simple patient-centered strategies can effectively fortify successful transitions from one discharge setting to the next. Checklist: Does my interdisciplinary team leverage patient/caregiver involvement? Is there a framework that provides for consistent patient advocacy and health literacy? Does the IDT consistently/effectively communicate with patients/family members, including implementation of The Final Rule’s measure of a 48 hour family care plan meeting? Ways in which to assess understanding of discharge plan and education provided? Family’s understanding/commitment to follow up MD visits? A review of what to do if a problem arises? Tracking of hospital readmissions at 30 days, 60 days, and 90 days? 3) Clinical excellence is the hallmark of safe, efficient transitional care. Advanced clinical programming that is aligned at all levels will set the table for mitigating functional decline and hospital readmissions as well as optimal performance outcomes. Ongoing evaluation of satisfaction surveys, root cause analyses on all readmissions, etc. Patients are less likely to have a decline or be readmitted, and they are more likely to score positive functional outcome metrics when they can teach back or demonstrate knowledge regarding the disease/condition. HealthPRO®/Heritage has developed a proprietary process to ensure exceptional transitional care for every patient from one care setting to the next. Based on our experience serving clients in all care settings (acute care, skilled, AL/IL, home health and out-patient), the recently launched “Safe Transitions Framework” is adapted from principles outlined in the evidence-based, protocol-driven practice from Boston University: PROJECT RED (Re-Engineered Discharge). Variety is the spice of life, and HealthPRO®/Heritage recommends carefully considering several data points and objective, evidence-based tools to track, manage and inform decisions regarding clinical programming. For example, when developing niche programs on behalf of our clients, objective performance data serves to guide our clinical strategy. Likewise, HealthPRO®/Heritage recommends use of evidence-based clinical tools to assess, track, manage and leverage patients’ progress. As part of our “Safe Transitions Framework,” we guide the interdisciplinary team in utilizing the tools which allow for the most comprehensive and individualized program for each patient. SUMMARY: If you can’t stand the heat, stay out of the kitchen. As patients move through the care continuum, processes must be in place to ensure safe transitions. Providers at all levels of care are charged with the same challenge: to proactively manage risk and influence key performance drivers (i.e: length of stay, patient satisfaction and hospital readmissions). In light of the industry’s sweeping regulatory and practice changes from CMS (THINK: The Final Rule) and all-encompassing network narrowing of preferred providers, the implications are far-reaching. 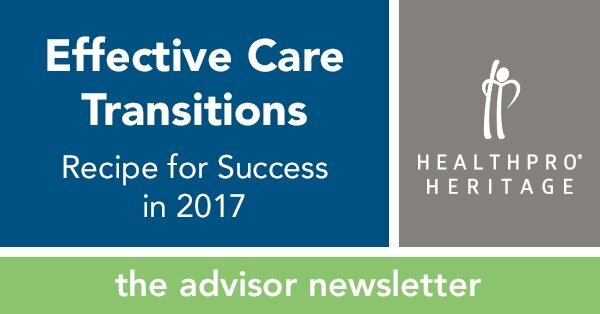 To be successful and remain competitive in 2017 and beyond, providers must continue to have an appetite for prioritizing effective transitional care! ASK: How can you enhance your current processes to ensure care transitions are a focus in 2017 and beyond? HealthPRO®/Heritage can help. Please contact Clinical Strategies at ClinicalStrategies@healthpro-heritage.com to get started.